Today you’re going to learn how to ask what someone’s hobbies are. Again, you can ask directly “what are your hobbies?” But as you can imagine, there’s a different way. And if something is your hobby, you do it fairly regularly. Hobbies can be reading books, growing roses or collecting action figures. 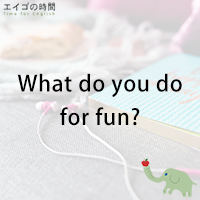 So, what do you do for fun? Well, you don’t have to answer this question right now. Instead try a short quiz. Ready? Which of the following would qualify as a hobby?